Situated just by the lake, patrons dining at Sanook got to enjoy a pretty good ambiance with a really nice view of the lake. Having good food while lazing back in the chair enjoying the night air was pretty cool. Sanook Bistro and Sports Bar had a full fledge bar counter complete with pool table and alcohol of all types on their first floor. That was where the crowd was at, which I found out when I went up to explore the place. We were treated to a variety of really god food from their menu "Chef’s Selections: Simply The Best". True to it's tagline "Simply The Best", Sanook brought out most of their signature dishes for us to sample that night beginning with the Italian fusion dishes. The Marco's Spaghetti Alio e Olio Seafood Special was one of the better dish of the night, which came with fresh tiger prawns, mussel, clams, & squids, flavored with coriander, crispy garlic and chilly flakes. Now I've always loved a good Alio Olio, and these came perfectly done. The Excuse Me One Lagsana Please had a rather unique name, and when the dish came, I couldn't help but enjoy the luscious cheesy toppings with a choice of either beef or chicken tucked inside. "Garfield" came to mind, and I began to imagine myself growing to be a really fat cat. Next up on the "Chef’s Selections: Simply The Best" menu were the poultry dishes. We had chicken in all type of flavours from the Alfresco BBQ Wings (hot & spicy smokey chicken wings served with roasted herb garlic and sour corn mojo), to the uniquely fused Ayam Percik Vietcong (malaysian style BBQ chicken served with Vietnamese peanut sauce and pilaf rice and garnished with spicy acar rampai and fish crackers). Personally I liked the Teriyaki Char Siew Chicken Chop as it had this distinct pseudo Japanese flavour fused with our local Char Siew Chicken. Before diving into my favourite steaks, we were served with this rather cute Kim Yang Lamb Cutlets. Don't be fooled by it's simple presentation as the lamb itself was coated in korean spices, charbroiled to perfection and accompanied with the Korean kimchi. How's that for a mish mash of taste? Being a steak lover, any good meat that was served hot be it on a skewer or a platter, I just had to have some whenever I'm given a chance. The New York Strip Steak (best cuts of beef strip steak roasted tenderly in special roasted garlic marinade and served with pomelo and sweet onion salsa and creamy garlic sauce) and Tangier Morrocan Steak (sirloin steak in tangy apricot glaze, grilled to perfection) came in generous servings which I found to be really juicy and tasty. Sanook's Sotong Otak Otak was another dish that looked really good even before digging into it. Doused in this really spicy sambal tumis, the grilled whole squids (250 gm) was stuffed with prawn otak otak. Needless to say, we braved though the spiciness to enjoy that giant of a squid. The desserts came out last, in the form of the Tiramisu (Old time Italian favorites of sponge cookie soaked in strong coffee with mascarpone cream) and the Chocolate Mud Cake (Savory mud cake with haagen Dazs vanilla pecan ice cream on vanilla sauce). Truly an enjoyable night out with good food, comfortable "by the lake" environment, and great friends, we just chilled on chatting away even after the meal. 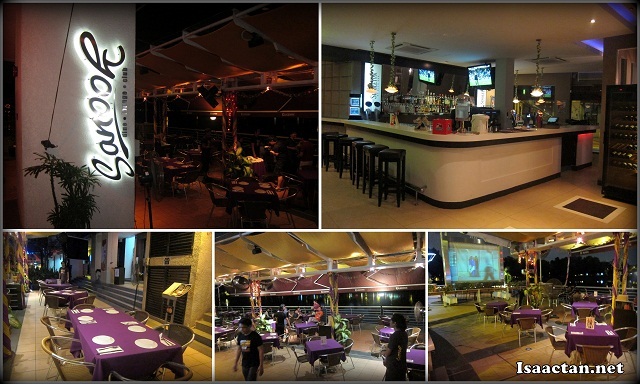 Do drop by Sanook Bistro and Sports Bar should you happen to be around the vicinity of Plaza Kelana Jaya. I really love the first photo! OMG! All the food looks awesomely delicious!! I want the lamb cutlets!!! sanook still looks good. i should return to check them out. being some time since i visited this place. Thai? Got ladyboy or not? Muahahahaha!!!! Hey...the food doesn't look Thai either....the nearest would be the Vietcong! Everything looks real yummy though... You belanja, we go there? Wink! Wink! Yeah, the food is pretty good. There's another branch in KL Sentral right? Or is that a different one? nice, looks like piccadilly with higher class food. How Clean or Dirty Will the 13th Malaysian General Election Be? I will surely go for the desserts first.. the mud cake look so tempting!